Help Change a Family’s Life! Christian Fellowship is partnering with Love INC on an Extra Mile Homes unit here in Columbia. The unit is a transitional home where people in crisis can stay for six months, while they learn how to provide for themselves and their families. They will receive Life Coaching and go through the Extra Mile program at Love INC. This will be a team project, and there are several ways to help, which will make a significant impact on the lives of the residents in the house. Our team consists of a Personal Growth Coach, an Extra Mile Money Management Coach, Life Events Leader, Turnover Team Leader and Property Management Leader. Volunteers serve under the coaches and leaders in each of these areas. Monica Chamberlain came to Love INC in 2014 underemployed, struggling to make ends meet. A single mom with four kids (two with significant medical issues), she needed full-time employment with benefits. A Side-by-Side job search coach helped her create a resume and walked beside her until she was hired in the dietary department of a local hospital. In 2017, after completing Extra Mile, she moved into Love INC’s newest transitional home. The timing was perfect. Monica’s lease ended at a house the landlord was unwilling to repair, in a neighborhood that was becoming increasingly unsafe for her kids. She faithfully kept her job but could not keep up with medical expenses, car repairs and a payday loan taken out to pay essential bills. A Love INC coach unexpectedly donated a three-bedroom house and Monica moved in a day later. 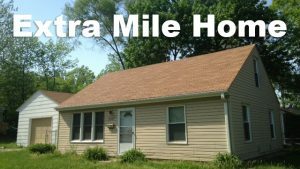 The Extra Mile Homes program lets Monica live rent and utility free, allowing her to pay off debt and save. She paid for extensive car repairs, retired over $2,000 of debt, including her payday loan, and saved over $1,000. Home ownership may not be as far off as it once seemed. A community member, aware of Monica’s hard work has purchased a home, renting to her at below market rate, with an option to buy. Monica says the key for her was writing things down in black and white. It started with a resume, then a household budget, and finally a running tally of expenses. Her “black and white” efforts are producing a full-color future for herself and her family.